Fun title, huh? OK, nothing like an Indiana Jones movie here. 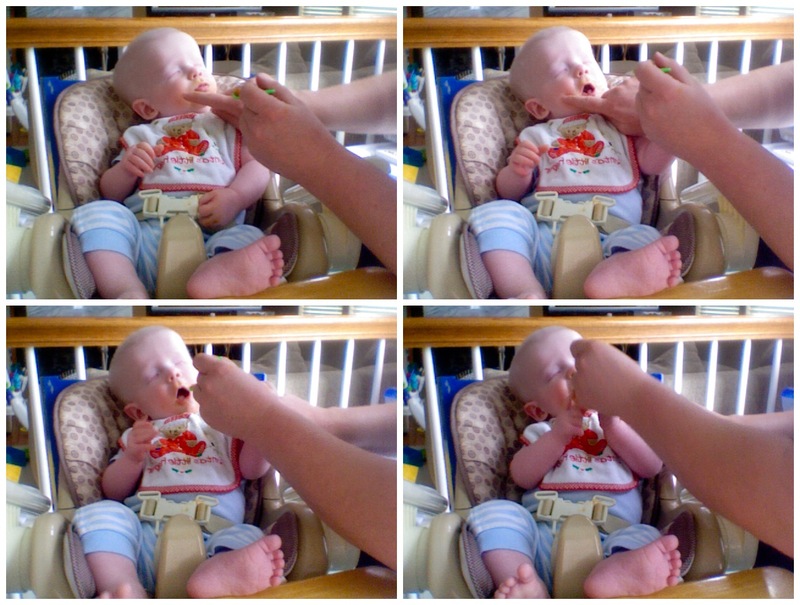 During the past month, we've started adding baby food to his routine. At first I was concerned about him pushing the baby food back out of his mouth with his tongue. Turns out it's normal with all babies and their first baby food experiences. He's doing wonderfully, especially with sweet potatoes, carrots and bananas. In the video below, Orion stars as the baby during a typical highchair feeding session. How does he know the food's coming? There's even a bonus scene of him reacting to green beans! Also, today Orion lift his head up while laying on his tummy and held it up for 1, maybe nearly 2 seconds, twice! He was smiling while doing this. Gallaudet University's Administrative Programs and Services Review Committee (APSRC) report released in December 2010 showed that the Children's Instructional Summer Program (CISP) has been recommended for closure. At this point, the word out there is that there will be a final review during the first week of March 2011 before announcing the fate of CISP. CISP has served Deaf, Hard of Hearing and hearing children in the community (metro Washington DC) for at least four decades. 2010 may have been CISP's last summer of operation. Reasons given are high-risk liability (camp location is a little too accessbile to the public even though nothing has happened); and the current summer location is needed by other campus programs (both reasons can be resolved by relocating elsewhere on campus). Help us show how much support there is behind keeping the ONLY LOCAL DAY CAMP FOR DEAF AND HARD OF HEARING CHILDREN OPEN. You can follow the link above to read and sign it. This petition also recommends the camp to include hearing siblings of deaf children and KODAs (kids of deaf adults). Our connection to CISP is that Skyler went there for 5 weeks during the summers of 2009 and 2010; Anastasia joined him in 2010. Orion: Pop Goes the Shell! Our Valentine, with shells in both eyes. Oops, I did notice Orion's left eye looked different today but didn't realize why I never saw him open his eye until I was putting him down in the crib tonight. There was a lonely eye shell in the middle of the crib! It apparently popped out sometime last night. I need to call SuperOcularist tomorrow for what I should do. Food-wise, Orion was doing a little better with baby food. Perhaps because he somewhat liked sweet potato better than rice cereal mixed with applesauce... but I know he's learning to eat and not push the food out with his tongue. That was interrupted with Orion staying at Children's hospital with oxygen via nasal cannula as he took a week (Jan 30-Feb 6) recovering from bronchiolitis caused by a nasty respiratory virus. (I'm grateful for the e-mails and visits. Thanks!) He went to the ER via ambulance from the doctor's office on Jan 29th and then again on the 30th when he was finally admitted. Yep, on the 6th Orion was released during 1st quarter of SuperBowl. Healthwise, he's doing very well. Sleepwise, he's sleeping during the day and awake at night... guess who has the night shift from Sunday through Thursday night?! Now we know he's willing to eat carrots. After putting on his bib in the bouncer, I give him a spoon to hold. Oftentimes he doesn't want to hold it. To let him know I'm going to feed him, I sign "eat" or "food" on Orion's lips, then I tap his cheek next to his mouth and he opens his mouth and in goes the baby food. 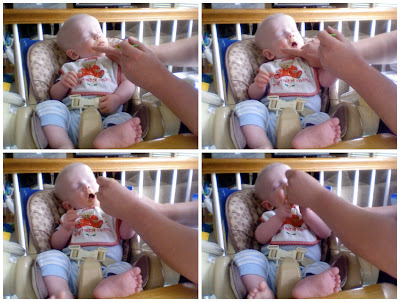 It took a while, especially when we had to stop and then start again when he got out of the hospital but here we are... he's eating off the spoon! Next, I think I should move on to letting him feel where the spoon goes to 'refill' itself. Messy, but he'll know how it works. I'm not sure, but I think Orion intentionally signed 'milk'. I was feeding fussy Orion some baby food and he squeezed my finger repeatedly like I'd squeeze his arm to sign 'milk'. I gave him some milk, he stopped signing it, finished his bottle and fell asleep. Last night he signed 'milk' again, so I gave him his bottle. I'm not sure if he's sign-babbling or actually asking for milk but I am watching him. Orion is wearing a STAR band (helmet) to encourage his head to continue to grow in a way that his head is nice and round again. 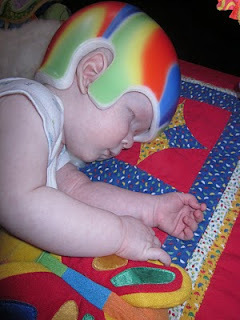 He has plagiocephaly (flat head) on the right side of the back of his head. The helmet doesn't squeeze on his head. The inside of the helmet has the form of a 'perfect head' and it fits around the longer part of his head (left back to right forehead) and that sort of puts a brake on growth in that direction and encourages his head to grow/fill in the direction of the right back and left forehead. He's to wear the helmet 23 hours a day for 12 weeks. He will have follow-up appointments every two weeks. He doesn't mind the helmet, only fusses if he's sweating or too warm (yes, like hats, it keeps body heat in). We can take it off for a little bit to let him dry and cool off. Orion still loves bathtime and the perhaps overly curious company of other little ones. He kicks his legs like a frog and wiggles vigorously in the water. He has been away from other little kids, especially his little PIP friends for too long so it was so sweet seeing him smile when another little hand touched him today. There's something about little hands... cute little inquisitive hands.